Adding background music can drastically change the tone of your video. 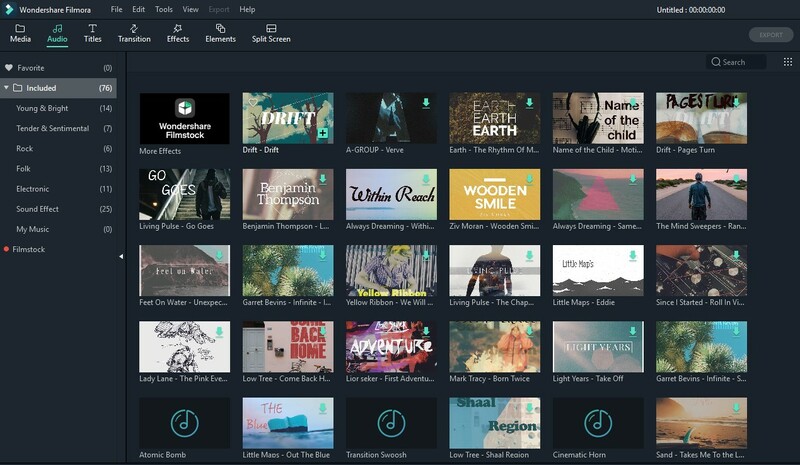 Filmora9 provides a royalty-free music library you can access within the program, or you can import your own music. Here are a few ways to add background music to your videos. Import Music from your Computer: Select an audio file that's stored on your PC and bring it into Filmora9. Click the button above the Media Library panel to browse for audio files in your computer. When you find the song or other audio file you want, select it and import it into the Media Library. You can also drag and drop audio files into the Media Library. From there, you can drag and drop your audio into an Audio Track in the timeline. Using Music from Filmora9: choose a song from Filmora9’s royalty-free audio library and use it for free. The audio library has 50 songs divided into five categories: YOUNG & BRIGHT, TENDER & SENTIMENTAL, ROCK, FOLK, and ELECTRONIC. There are also sound effects available under SOUND EFFECT. Once you've added your music, double click on the music in the timeline to bring up the Audio window. In this window you can adjust the volume and pitch of the music. You can also apply fade-in or fade-out effects and use their sliders to determine how long they will last. Note: you can add up to 100 audio tracks. In the timeline, move the playhead to the point in your audio clip where you want to split it. Then, right click on the clip and select "Split" or click the Split button in the toolbar above the timeline. To make adjustments to your audio, double click on the audio clip you want to work on in the timeline to open a panel with adjustment sliders for volume and pitch. You can also apply Fade in/out effects and adjust their lengths here. Another tool you’ll find in this panel is Denoise, which is a feature that can remove background noise from your audio clips. For a more advanced audio editing experience, you can also access the Audio Equalizer from this panel. You can choose from presets or make manual adjustments by clicking ‘Customize’. Give it a listen when you are done and, if you’re not happy with the results, click Reset to start over. To mute the audio in a video clip, right click on the clip in the timeline and chooseMute. You can detach the audio from a video clip without changing the original clip. To detach audio from video, right click on the clip and select Detach Audio. The audio will be detached from the video and automatically placed in an audio track. The detached audio clip will be automatically placed in the audio track, you can either choose to delete it or edit it for using. After adding the video clip to the timeline, right click on it and select Audio Detach. The audio will be detached from the video clip and placed in an audio track. Import the audio file you want to use from your computer or add music from the Audio library to an audio track. If you are using a higher quality version of the audio which you detached, drag it to an audio track underneath the separated audio and make sure the wave forms line up to sync it. Then, select the detached audio clip and delete it. To add a voiceover, go to media panel and select Record Voiceover under Record to bring up the Record Audio window. Click on and you will have 3 seconds before the recording starts. Once you are finished recording, click . The voiceover clip will automatically appear in the Timeline. If you want to record another voiceover, keep the Record Audio window open. In the timeline, move the playhead to a new position and click on again to record. Tip: To remove a recorded voiceover, right click on the voiceover clip in the timeline and choose Delete. Trimming audio clips works exactly the same as trimming video clips. Click here to learn how. To add a new video or audio track, click the Plus icon in the left upper corner of the timeline and then select Add Video Track or Add Audio Track. The track will be added. To add multiple tracks at a time, select Open Track Manager and then enter the number of tracks that you want to add. In the Track Manager panel, you can also customize the placement of the new tracks (i.e. whether they should be before or after an existing track). 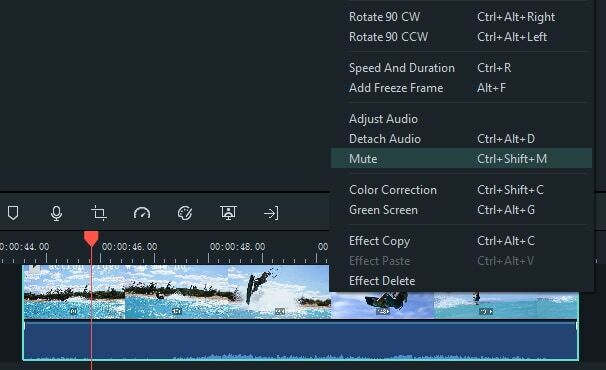 To delete empty video and audio tracks, click the Plus icon in the upper left corner of the timeline panel and then select Delete Empty Tracks. All empty video and audio tracks will be deleted. Click the Plus icon in the left upper corner of the timeline panel and then select Small, Normal, or Big under Adjust Track Height. To adjust the volume in the Audio panel: after you drag and drop the audio file into the timeline, double click on it to open the Audio panel. In the volume section, drag the slider up or down to adjust the volume. To adjust the volume in the timeline: Move your mouse over the volume band in the audio clip and the pointer will change to a hand icon . Drag the handle up to increase the volume and drag it down to decrease the volume. If you want to adjust the left/right balance, enter a numerical value or drag the knob in the Balance circle. A numerical value of 0 means the audio is balanced, -100 is all the way to the left and 100 is all the way to the right. If you need to have the volume increase and decrease as the clip plays, use audio key frames. To add an audio key frame, go to the timeline and move the playhead to the location where you want the change in volume to start. Double click the audio clip to open the Audio control panel and click the key frame button. Next, move the playhead to where you want the volume adjustment to end and click the Keyframe button again. 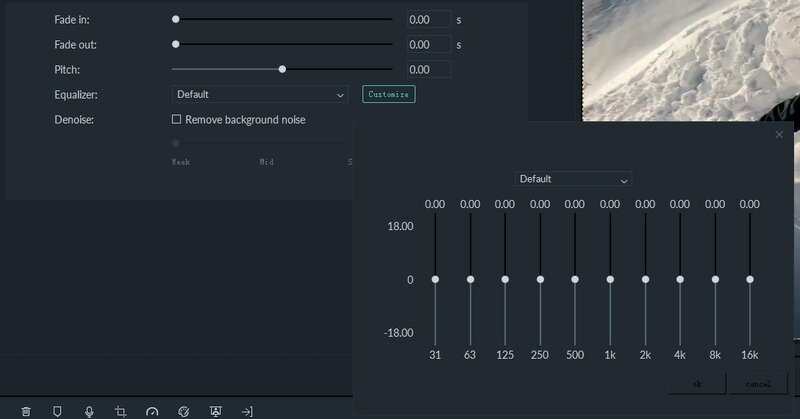 Now you’ll be able to rag the volume envelope (the line between your two keyframe dots) to adjust the volume of that section of your audio clip. After adding your audio to the timeline, double click on it to open the Audio adjustment panel. Set fade in and fade out effects by dragging the sliders or by entering how many seconds a fade effect should last. You can also use the fade icons at the left and right edges of the audio waveform areas to quick fade in and out. At the beginning of the audio clip, drag the fade in maker to the right to apply a fade in effect. To apply a fade out effect, go to the end of the audio clip and drag the fade out maker to the left. The further you drag, the longer the fade effect will last. Right click on the audio file and select Speed and Duration. You could also select the audio clip in the timeline and click the Speed icon in the toolbar. Double click on an audio clip in the timeline panel to open the Audio adjustment window. Check the box next to Remove background noise. Drag the slider to the level (Weak, Mid, or Strong) of noise reduction that you need. To remove background noise from a video clip, double click on the video clip in the timeline to open the video adjustment panel. Go to the Audio tab and then follow the above steps. Note: The types of noise you can remove using the denoise tool include wind noise, computer hums, and other consistent sounds. Double click the video or audio file in the timeline and then go to the Audio tab. You can select presets in the Equalizer dropdown list, including Default, Classic, Low Bass, Sparkle, Pop, Rock' n' Roll, Soft, Techno, Hard Rock, Ska, Country, Acoustic, Folk, Blues, and Custom. Or, you can click the Customize button and access the Custom Equalizer window to adjust the gain by dragging the sliders up or down. Click OK button to save your adjustments. Select the audio mixer icon in the toolbar to open the Audio Mixer panel. You can switch the sound between left and right by dragging the knob in the Pan/Balance control. You can see your changes clearly in the channel control panel to the right. There are two modes: Stereo and Surround. In Surround mode, you can pan from left to right as well as front to back, which gives you full control of the audio position in Surround sound mode. While in Stereo mode, you can only pan left or right. You can also go to the master section and drag the Master volume slider upward or downward to adjust the master volume higher or lower. After you’ve made adjustments, click the Play button to hear the results. Select OK to save the settings.